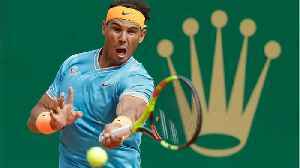 ▶ Videos for "Monte Carlo Masters"
Rafael Nadal advanced to quarter-finals of the Monte Carlo Masters, but there will be no showdown against old rival Novak Djokovic. BARCELONA (Reuters) - World number one Andy Murray was forced to dig deep to overcame Albert Ramos-Vinolas 2-6 6-4 7-6(4) and reach the Barcelona Open semi-finals on Friday, avenging his defeat by the..
Rafael Nadal claimed a record-extending 10th Monte Carlo Masters title with a 6-1 6-3 victory against fellow Spaniard Albert Ramos on Sunday. 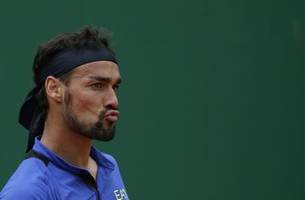 Albert Ramos-Vinolas has booked his spot in a fifth career final after a three-set win over Lucas Pouille at the Monte Carlo Masters. The upsets have continued at the Monte Carlo Masters with former world No.1 Novak Djokovic the latest big name bundled out. A day of upsets in Monaco has seen world No.1 Andy Murray and third seed Stan Wawrinka both sent packing from the Monte Carlo Masters. PARIS (Reuters) - Spaniard Albert Ramos dumped world number one Andy Murray out of the Monte Carlo Masters 2-6 6-2 7-5 on Thursday after firing back from 4-0 down in the final set to take his place in..
Andy Murray has recovered from an elbow injury but was forced to do things the hard away against Gilles Muller at the Monte Carlo Masters. PARIS (Reuters) - World number one Andy Murray beat Luxembourg's Gilles Muller 7-5 7-5 to reach the third round of the Monte Carlo Masters as he made his return from a five-week injury layoff on..
World number two Novak Djokovic came close to an early exit at the Monte Carlo Masters but finally emerged triumphant with a 6-3 3-6 7-5 second-round victory against France's Gilles Simon. MONTE CARLO (Reuters) - World number two Novak Djokovic came close to an early exit at the Monte Carlo Masters but finally emerged triumphant with a 6-3 3-6 7-5 second-round victory against France's..
Gilles Simon pushed him to the limit but Novak Djokovic scraped through to the third round in the Monte Carlo Masters. Bernard Tomic's run of outs has continued into the claycourt season with the Australian suffering a first round loss at the Monte Carlo Masters. 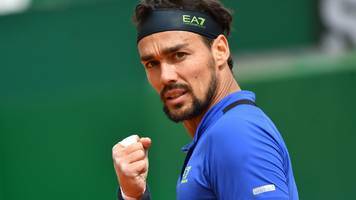 Despite an improved second set Bernard Tomic has slipped to another first round defeat, this time at the Monte Carlo Masters.